I woke up with the condensation dripping on my head. Great, the inside and outside of my tent were wet. I packed up quickly and was hiking by 630am. Still being on the forest roads, it was a pleasant morning. By 10am the sun was shining and I was hoooooot. On the road, a lady stopped by to let me know “the scenic trail is very wet, if them ditches are full, the trail is bad”. I thanked her for the intel. I arrived at the Langston House for a much needed rest and dry out my tent. After packing up I was about to head out until I started screaming like a little girl. 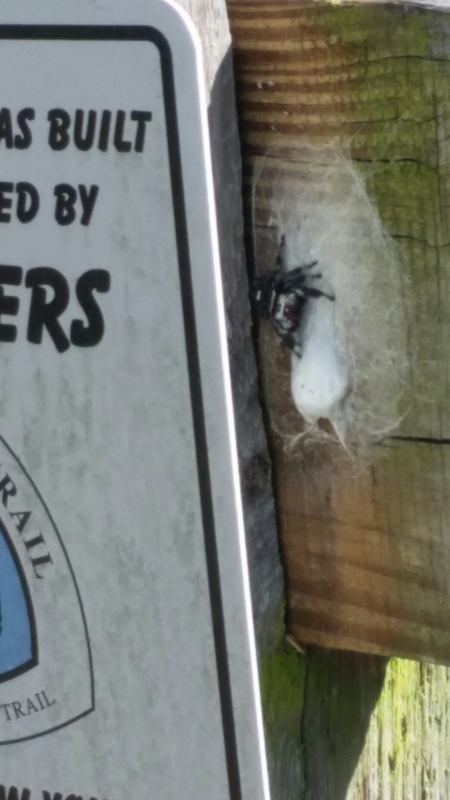 Something, right next to the Florida Trail signage was looking at me and moving as I was moving… A NASTY SPIDER. Yeah yeah I can hear you laugh already but this was no ordinary one. It had red fangs and black and white hairy body. It was moving as in it was about to pounce to attack me. I nearly peed my pants… Okay maybe a peed a little. It was so gross. I called it “buddy” and quickly ran past it. Whew. Such a nasty looking one. I still have shivers as i am typing this. The photo was taken 10ft away and zoomed. I couldn’t bring myself to get any closer. The trail after that was a combination of dry and mushy. 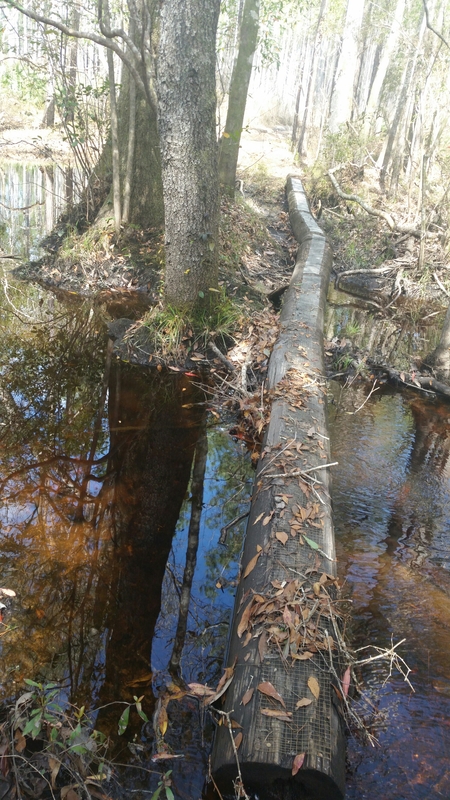 The trail had been well enough maintained and even had massive logs to go over bigger water crossing. Now, that was nice! The mushyness of the trail with the algea just kept my shoes at a constant wet feeling. The day got hotter, so did my wet, now hot, feet. Each break I was wringing out my socks, phew! Now they stunk baaaad. Even my hands smelled like this. Yuck. Finally I decided to hop back to the forest road 4 miles before I set camp. I looked ahead and saw the campsite I had it mind was in another marshy area and few miles later, there was another swamp. I am happy walking the forest road for now. Those roads are becoming more and more a better alternative to the trail itself. Shame shame. 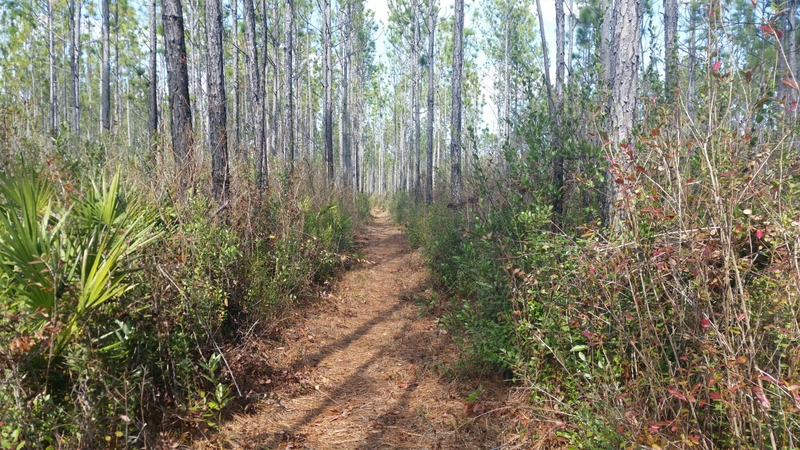 Don’t get me wrong, there are really pretty sections throughout but when it calls for a swamp or marshy area, I would rather hike the road. 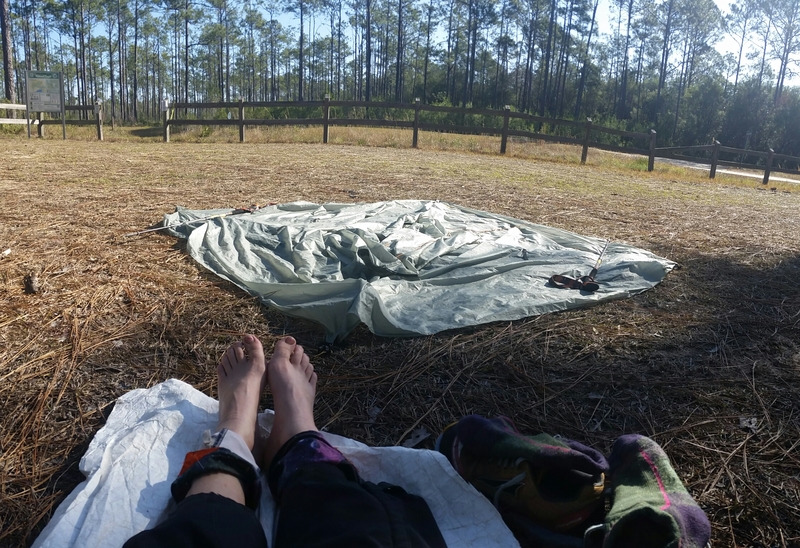 I finally made it to camp with absolute sore feet. I didn’t really find a good spot in the woods as the forest road is surrounded by brush or marsh in this area. So the side of the road it is. Makes for an easy start in the morning tomorrow. Which likely going to be early again as I can feel myself being ready for bed and it’s not even 6pm! I have to tend to my poor feet first. They hurt a weee bit. The moon in Florida is sooooo bright. Every night it feels like a spotlight on my tent.I could almost read a book! If I sleep with my doors open, I need something over my eyes because it is shining so bright. The sky, each night, sparkles with stars. Wish I wasn’t so tired each evening to watch it longer. I’ll be dreaming of dry feet and fresh food tonight. Happy trails! I’m happy you were able to hike and enjoy St Marks. 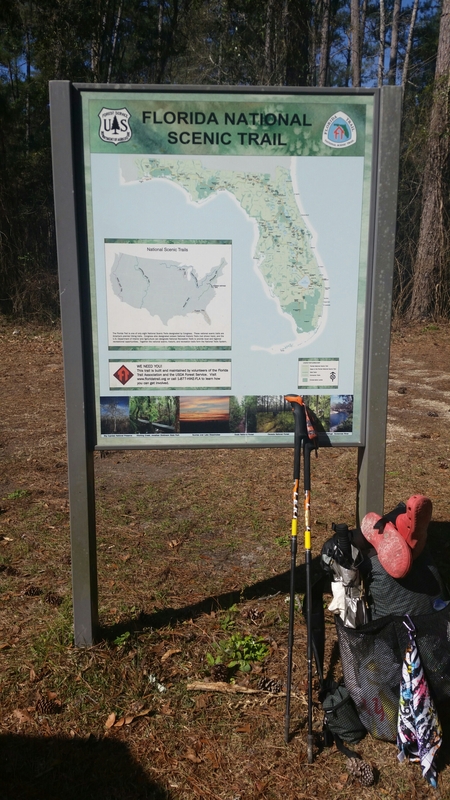 It is one of my favorite parts of the Florida Trail. From that campsite you have pictured you can see on a clear day south the curve of Florida along the coast. Hiking in this much water as we have had you might want to add vinager to your socks and cloths when washing to kill the fungus that as a hiker we have a problem with. Bleach also works but can also destroy our cloths. I don’t know how much free time you have but if you can get away and hike St Joseph’s Penninsula Wilderness which is 20 miles of wilderness beach you won’t be disappointed. Hike on. Hope your out of the woods during this storm. I wish I was! Currently hunkered down in my stealth camp spot. Hoping it passes without issue.